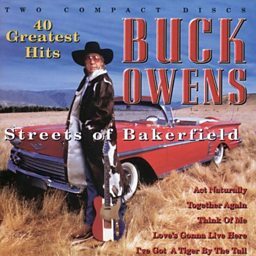 Alvis Edgar Owens Jr. (August 12, 1929 – March 25, 2006), professionally known as Buck Owens, was an American musician, singer, songwriter and band leader who had 21 No. 1 hits on the Billboard country music charts with his band the Buckaroos. They pioneered what came to be called the Bakersfield sound, named after Bakersfield, California, the city Owens called home and from which he drew inspiration for what he preferred to call American music. While Owens originally used fiddle and retained pedal steel guitar into the 1970s, his sound on records and onstage was always more stripped-down and elemental. His signature style was based on simple storylines, infectious choruses, a twangy electric guitar, an insistent rhythm supplied by a drum track placed forward in the mix, and high two-part harmonies featuring him and his guitarist Don Rich. From 1969 to 1986 Owens co-hosted the popular CBS television variety show Hee Haw with Roy Clark. 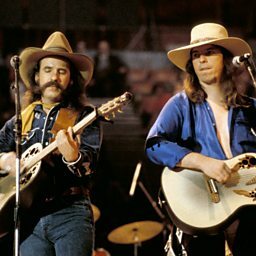 According to his son, Buddy Allen (Owens), the accidental death of Rich, his best friend, in 1974 devastated him for years and halted his career until he performed with Dwight Yoakam in 1988.